So... does FiddleBop play Gypsy jazz? Or not? Heraclitus (a Greek philosopher who was around about 2500 years ago) reckoned that "There is nothing permanent except change". And he was right. Django Reinhardt and Stephane Grappelli jointly created that new thing, Gypsy jazz, in the 1930s, and since then the music has never stopped changing. Changes in instrumentation, playing style, repertoire... the lot. Nowadays, there is a clear mainstream style of gypsy jazz. But the vigour of the music is such that there are also lots of thriving hybrids. Of which the present-day FiddleBop is one. So, besides the obvious (instrumentation: keyboards and fretless electric bass), what distinguishes FiddleBop from mainstream Gypsy jazz? "The blended voice is FiddleBop's choice." We love harmony singing. Now, vocals are common in modern Gypsy rumba bands like The Gypsy Kings, but they were not in Gypsy jazz bands of the 1930s. Vocal harmonies are still rare in mainstream Gypsy jazz. But we in FiddleBop really enjoy blending our jazz voices! "Hot jazz stomp, mais sans la pompe". Our approach to rhythm is different... In the early years, Gypsy jazz was always played with a rhythmically rigid accompaniment called 'la pompe' ('the pump'). FiddleBop prefers a more fluid, flamenco-like style. Which underpins FiddleBop's powerful rhythmic drive, our exciting and sizzling version of hot Gypsy swing. Our FiddleBop beat for gypsy feet! "Jazz from all times. Everything's fine!" We FiddleBoppers have wide-ranging musical tastes. 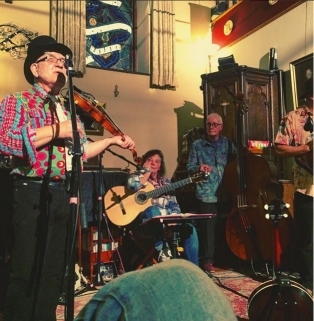 So FiddleBop's sets include plenty of Gypsy jazz classics, as well as standards (and musical surprises too) from all periods of jazz. Danceable ditties from the early New Orleans years; the gin-soaked jazz of Fats Waller; romantic Cole Porter ballads from the swing era; beret-and-goatee-wearing beboppish compositions; jazzy versions of classic pop hits and folk songs and tunes; and some of our own compositions. "Jazz of the best, but still with a jest." Creating music is what we love to do. But we try not to take ourselves too seriously. We in FiddleBop always have fun playing the music that we love. Which means that the audience has fun too! And what is it that we share with all other Gypsy jazz groups, of whatever flavour? That's easy: the sheer joy of creating music... and that undefinable but I-know-it-when-I-hear-it "Gypsy zing"!